Xyla Foxlin (middle) poses with Beauty and the Bolt staff members at CES 2019. A group of Case Western Reserve University student entrepreneurs are headed to one of the biggest consumer technology trade shows in the world. Nearly three dozen students, alumni and Case Western staff were picked for the annual CES trade show, which features thousands of tech companies and start-ups from around the world. Beauty and the Bolt is one of the Case Western projects being presented, a teaching site that attracts women and minorities to makerspace tools such as 3D printers. Co-founder and Case doctoral student Andrew Dupuis says the company hopes to find partners at CES. “We’re really hoping to find companies that are willing to support us by donating products, by donating tools, by sponsoring videos that we can then put out on YouTube or on through custom videos through schools, but finding those partners is a really big reason why we’re going to CES," he said. 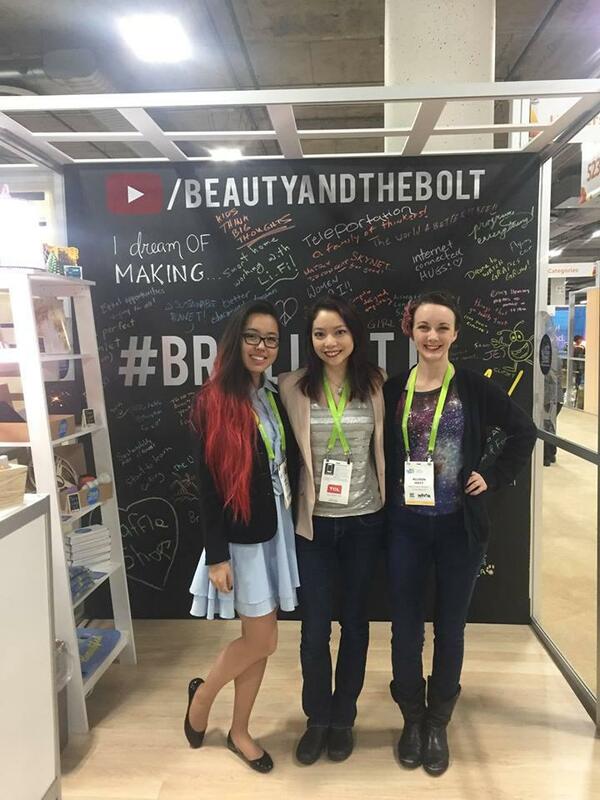 Xyla Foxlin (middle) and Beauty and the Bolt team members at a booth at last year's CES. Case student and Beauty and the Bolt co-founder Xyla Foxlin has attended CES for the past four years and said there are a number of different opportunities to take advantage of. “I’ve done a lot of different approaches to the conference, like I’ve gone and tried to make sales with my previous start-up, I’ve gone and tried to find investors with my previous start up, and then last year I was really chasing press and media. I think this year’s big goal is to find corporate partnerships and people in the industry who can help us," Foxlin said. CES starts January 8th in Las Vegas and goes through the 11th. Editor's note: This story has been updated to include the full name, Case Western Reserve University, the first time it's mentioned in this article. The Internet of Things refers to devices that collect data and transmit the information to other pieces of technology through the web.